How does the CO₂ as a natural occurring gas helps marijuana grows faster with increased yields and what are the most effective methods of implementing CO₂ to your indoor garden. Indoor cannabis cultivation has definitely changed over the past few decades, with once basic closet low powered lamps evolving into advanced engineered automated systems capable of producing unbelievable yields in a limited amount of space and time. Achieving maximum yields in the shortest period possible has become every indoor grower desire, and so far numerous methods have been tried and tested. Besides the more commonly used techniques for increasing plant growing potential, there are a few more controversial techniques not yet fully approved by dedicated cannabis growers. One technique that often has its effectiveness debated is the CO₂ enrichment of a growing area. It is scientifically proven that plants use CO₂ as fuel for photosynthesis, and with more CO₂ there should be a noticeable difference in the speed and size of growing plants. Unfortunately, many cannabis growers have learned from experience that numbers shown in theory don’t necessarily follow through in practice. Therefore, it’s valuable to understand how CO₂ works in the world of indoor cannabis growing and what are the effective methods that can actually harness its potential. The effects of CO₂, or carbon dioxide, on cannabis, are no different than that are in any other plant species on the planet. It’s simply a part of the photosynthesis process where the plant produces energy from natural or artificial light. CO₂ is part of the air that a plant inhales and after photosynthesis, in turn exhaling oxygen, a gas that enables life on earth. It is suspected that in prehistorical times, the concentration of CO₂ was much higher than today, and it caused significantly larger growth. The normal concentration of CO₂ in the air today is 300-400ppm, which is a lot less a cannabis plant can handle given that enough light is provided. Light intensity plays the key role in CO₂ implementation, and it should be considered only in setups with high powered HPS and MH lamps. The increased concentration of CO₂ in the air gives cannabis the ability to produce much more energy from light than it would in a natural environment where CO₂ doesn’t exceed 400ppm. Setups with 600-1000W HPS or MH lamps can easily be supplemented with 1200-1500ppm of CO₂, fuelling plants to grow larger and faster. Higher concentration of CO₂ increases photosynthesis in plants making them hungry for more nutrients and water than they normally would. It is important to mention that before supplementing your operation with magical CO₂, every other requirement for growing healthy plants should be met. CO₂ will have insignificant or even damaging effect when exposed to unhealthy or nutrient hungry plants. So the best result you can get from CO₂ is when it’s added to a previously optimized setup with plenty of light power. Well fed, healthy plants with some LST training are set for large yields by that alone, and will certainly benefit the most from CO₂. One of the more obvious reasons for adding CO₂ to a grow setup is to squeeze that extra juice from the nutrients and make your plants grow fast and big. Some growers reported a 20% increase in yields and speed of plant maturation. These numbers can only be achieved when every other need of a plant is met and with a maxed out light intensity for the grow area. The most notable increase in growth shows when plants are in the vegetative stage, but many growers are using CO₂ all the way to harvest. Plants exposed to 1000-1500ppm of CO₂ saturation will be able to endure higher growing temperatures of up to 30-35°C. This works hand in hand with bright lights that are needed for CO₂ supplementation. Such lamps produce much more heat than low powered CLF’s or LED lamps, and CO₂ negates that undesired effect which is often encountered in non-CO₂ setups. The majority of CO₂ injection methods require a sealed growing room without any air, or in this case, CO₂ leaks. This also stops any unwanted marijuana smell venting out, adding to the security of your grow space. Also, CO₂ generators burn natural gas as a process of releasing CO₂, producing smell on its own and conveniently masking the smell of blooming marijuana. Any effective method of CO₂ supplementation used today doesn’t come cheap. There is simply no way around this and if you are considering CO₂ enhancement for your garden don’t spare any money. Investing in cheap ineffective CO₂ setup is just a waste of time and money. Even though the initial cost of good quality CO₂ setup is high, the maintenance is actually much cheaper and it will certainly pay off in the long run. As mentioned before, CO₂ injection becomes effective only when there’s bright light present. Many growers who are growing with a limited amount of space and light will not benefit from the higher CO₂ concentration. Anything under 600W/m² is considered too low for CO₂ injection. With larger growing space more light is needed. Various methods of adding CO₂ to grow room requires sealed setups that have high humidity as a side effect. The increase in heat makes cannabis transpire more, raising humidity levels and setting up a plant for mold and other humidity related problems. It is crucial to keep track of humidity levels in CO₂ setups and ensure proper airflow inside the growing space. Growers who are maxing out the CO₂ injection often use dehumidifiers to control humidity. The ways of adding CO₂ to your grow are numerous, but there are few methods that are notably more effective than others. Unfortunately, these are often the most expensive and harder to set up. Supplementing CO₂ via CO₂ tanks or CO₂ generators is highly recommended and many experienced growers swear by these methods and their potential benefits. The CO₂ tanks are filled with compressed CO₂ and are the most stable way to inject and control CO₂ supplementation. Even though it’s costly, it is also one of the easiest method and possibly the best one to start with. The CO₂ bottles or tanks are placed outside of growing space and are connected via fitting tubes that pump CO₂ inside the grow room or tent. Considering that CO₂ is heavier than oxygen, the tubes should be set up to release CO₂ above the plant level, “raining” down on the leaves. This is important because plants absorb CO₂ through leaves or specifically stomata (the tiny pores on leaves). Another great perk of using CO₂ tanks is the possibility to control the desired amount of CO₂ released. It is achieved by using a pressure regulator and controllers which are set up to monitor the levels of CO₂ inside the grow space. 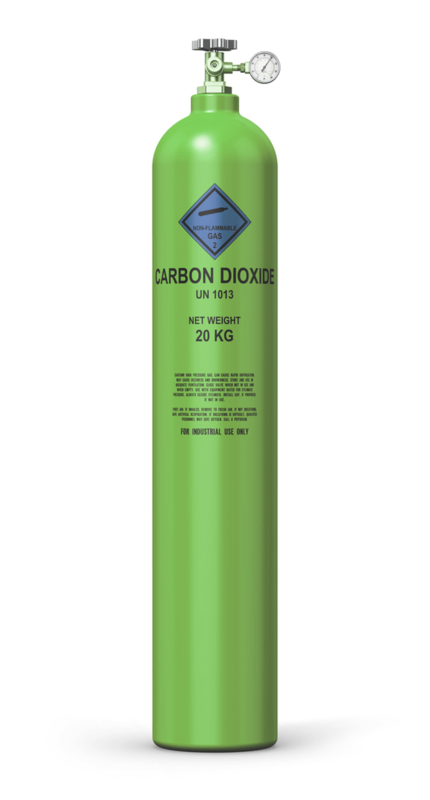 Once the desired level is set up the amount of CO₂ released is automatically controlled. This method requires a sealed setup for maximum effect, and to avoid heat and humidity problems, proper ventilation is needed. The best way of separating air inside the grow space from outside is by using cooltubes and hooded reflectors. Using these ensures that every bit of CO₂ stays inside the grow space and remains untouched by air from outside while also reducing heat created from the lamp. There are few downsides of using CO₂ tanks that should be considered. The air that is supplemented by CO₂ can be potentially harmful to humans and should not be inhaled. Make sure that you turn off your tanks before tending to plant's other needs. Also be careful how you transport those big tanks since they can draw unwanted attention. The CO₂ generator is a device that produces CO₂, usually through combustion of propane or natural gas. It is another effective way of CO₂ enrichment and just like the CO₂ tanks, it doesn’t come cheap. Once set up they are easy to operate and can be fully automated through a controller that comes with most models. CO₂ generators are usually closed systems where gas is burned internally, but some models come with an open flame. You should avoid these models as they pose a great fire hazard. The safest and most cost-effective way of setting up a generator is to connect it to the municipal gas line. This way there’s no need to go shopping for expensive refills that can raise your neighbor's curiosity. In the process of burning, CO₂ and water vapor is released into the air. As the CO₂ levels increase so does the unwanted humidity. Along with produced heat, humidity is one of the downsides of using the generators and should not be left unchecked. Take special care if you are using CO₂ generators in smaller grow space, as they will raise humidity much faster than in spacious indoor gardens. A bonus feature of using CO₂ generators is that the burned gas produces an intense smell, covering up the distinctive marijuana scent. Other alternative methods of CO₂ enrichment that growers often experiment with includes use of dry ice, compost bags, fermentation and CO₂ bags. As these methods may seem practical and cheap, they are far less effective and not recommended for serious growers. Adding CO₂ to your indoor operation may seem discouraging at first, considering the fact that most of the used methods are expensive and include big devices that take up a lot of space. But for those growers who already know their way around their fine-tuned grow room, CO₂ enrichment may come as an excellent added value. Either way, implementing CO₂ still remains a luxury for many indoor growers but as the cannabis cultivation advances these methods may become a common practice.